Almost a year in, the job isn’t easy. “With just the two of us, it’s a lot of work,” Maher notes. Sillivant adds, “It’s been a labor of love.” Most days, they divide and conquer: Sillivant is the resident dairyman, checking off two three-hour milking sessions a day. “I’ll talk to the goats, and sometimes sing to them,” he laughs. Maher focuses on churning out the chèvre: “It’s so rewarding to make a product and deliver it to the chef yourself,” he says. 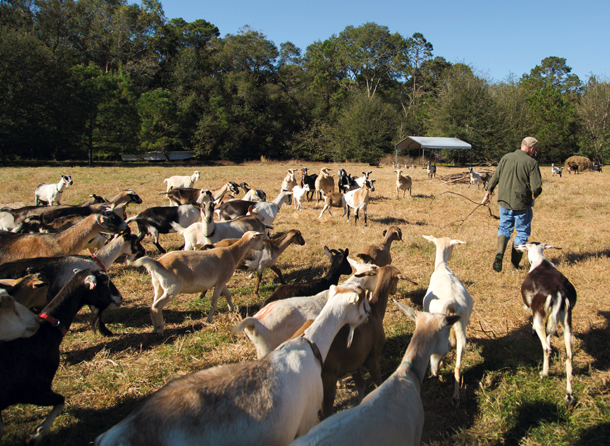 The biz has some noteworthy clients, too: Husk, Charleston Grill, and Sorghum & Salt, among others, serve their cheese, thanks partially to the help of distributor and small farm advocate GrowFood Carolina. Burden Creek goods can also be found at other area retailers including Veggie Bin and the John’s Island Farmers Market. While they’re only vending soft cheeses and raw goat milk for now, Maher wants to experiment with hard aged cheese in the future. “My goal is to come up with the next Humbolt Fog,” he says, referencing the acclaimed California goat cheese. To take a behind-the-scenes tour of the farm, watch our video here.